In this blog post, Norman Solomon, the author of Judaism: A Very Short Introduction, considers how ambivalence towards past violence comes out in the way the rabbis told the story of Chanukah. It started innocently enough at a lunch-time event with some friends at the Randolph Hotel in the centre of Oxford. ‘The trouble with Islam …’ began some self-opinioned pundit, and I knew where he was going. Simple. Islam lends itself to fanaticism, and that is why Muslims perpetrate so much violence in the name of religion. Image credit: “Memorial to the Oxford Martyrs” by Kenneth Allen. CC-BY-SA-2.0 via Wikimedia Commons. ‘But that was 500 years ago. We’ve come a long way since then! And what about you, and all those atrocities in the Old Testament?’ That stung me. Ignoramus – didn’t he know that Judaism has moved a long way from the days of the ancient Hebrews? ‘That was 2,500 years ago!’ I retorted, and we moved onto a less contentious topic. Being Jewish, I am of course impartial as between Christianity and Islam, both of which shout for peace but have bloody histories, with violence committed in the name of God by Christian against Christian, Muslim against Muslim, one against the other or either against some other unfortunate victim, such as the Jews. Image credit: “Juda Maccabaeus” by Guillaume Rouille. Public Domain via Wikimedia Commons. But can I really wash my hands of all this? Not a Jewish problem, at least not for thousands of years? Well now, think again. The Bible is still a part of my history and I have to take some attitude to the fact that it often encourages violence in the name of God. We are about to celebrate the Jewish festival of Chanukah, so do I take sides with the ‘valiant Maccabees’ who – in God’s name – carried on a guerrilla war against the Seleucids and eventually, with much bloodshed and mutual slaughter, gained control of Judea? (OK, the story is not in the Hebrew scriptures, and the events are more recent by a couple of centuries, but so what?) By modern standards the Maccabean warriors were violent religious fanatics. Judas Maccabeus is not the sort of man I would be comfortable to invite to tea; I would be pretty guarded in my answers if he asked me any awkward questions, and probably looking over my back to see if I was being watched by MI5, or the Seleucid equivalent. One person’s religious fanatic is another person’s freedom fighter; hardly an excuse, more like a choice between the devil and the deep blue sea. The dilemma is ancient. Ambivalence towards past violence comes out in the way the rabbis told the story of Chanukah. There is a vague reference to some ‘victory over the Greeks’, but the kernel of the story is about a miracle that happened with a jar of oil when, following the victory, they rededicated the Jerusalem Temple. The idolatrous ‘Greeks’ had contaminated all the oil, but one jar was found with the high priest’s seal still on it, and that miraculously lasted for 8 days until pure oil could again be sourced. Nowhere else — in the copious contemporary or near-contemporary accounts of the military campaigns and of atrocities perpetrated by the ‘other side’ — is such a story mentioned. No. The rabbis retold the story their way, using it not to incite violence but to instil faith in God’s saving grace. Which has at least dissociated them from the violence of the situation, even if from time to time others have revived the older stories and set up the Maccabees as models for emulation. So why head this blog ‘Plato’s mistake’? Don’t blame the Greeks! Because my Islamophobic friend and others like him who generalize about Muslims, or Christians, or Jews, or whatever other group they happen to target have fallen prey to the just error made by the great philosopher. It was Plato who dreamed up the notion of perfect forms (ideas) to which we can only aspire, and even though his own disciple Aristotle spotted the confusion, the error of essentialism took root and people still like to believe that there is some entity out there which is the ‘true’ Christianity, Islam or Judaism, just as Plato taught there was a true ‘good’ whose existence was superior to anything on earth. But there really is no such thing. ‘Islam’, ‘Christianity’, ‘Judaism’ are abstractions, not real things. What actually exists are Muslims, Christians, Jews – and of course, Hindus, Buddhist, Sikhs and so on. Real individual people in relationship with others who share a common name. There are violent Muslims; it does not follow that ‘Islam is violent’, or that they are not ‘really’ Muslims. Conversely, I would not be right to claim, ‘Judaism is peaceful’. All I can say is that this, that, or the other Jew is a peaceful person. All of us can tell our stories in many different ways. Some are violent, some peaceful. Nor is the secular world different. Nationalism, socialism and other secular creeds are all as variable as the individuals who take them on. Crimes have been committed in the name of each and every philosophy, and good has been done in the name of most of them too. It is not the creed that should shoulder the blame, but we ourselves. Feature image credit: “Synagogue Ceiling Brighton” by Hurk. CCO via Pixabay. 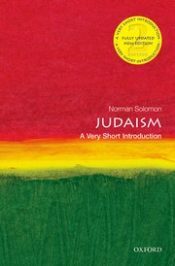 Norman Solomon is Fellow in Modern Jewish Thought at the Oxford Centre for Hebrew and Jewish Studies and the author of Judaism: A Very Short Introduction. The Very Short Introductions (VSI) series combines a small format with authoritative analysis and big ideas for hundreds of topic areas. Written by our expert authors, these books can change the way you think about the things that interest you and are the perfect introduction to subjects you previously knew nothing about. Grow your knowledge with OUPblog and the VSI series every Friday and like Very Short Introductions on Facebook. Subscribe to Very Short Introductions articles on the OUPblog via email or RSS. Following your line of thought, was nazism a neutral ideology with just some bad nazis who committed the Holocaust and other atrocities? Or isn’t it fairer to say that some ideas lend themselves to evil much more readily than others? Especially when they proclaim the evil is the right thing to do. Okay, but why does one voluntarily label themselves as “Muslim,” Jew,” Christian,” etc. unless they find some common core (not necessarily a Platonic essence) that is compelling and differentiates their prior ideas (as a “human” or some other non-identified organism/entity) from the new concepts/ideas created? It seems like we have to supply some meaningful distinguishing labels to modes of thinking (and as you point out, ways of “living”) or else we’re just playing games.